Baby hermann’s tortoise care is very important. During the first year of your tortoise’s life, extra special care must be taken. Because they are so small, it is easy for them to become too cold quickly or too hot and dehydrated. Your tortoise will require a good few inches of sterilised top soil and coco coir mixed in the table. Babies need to be able to dig down and bury themselves for proper eastern hermann’s tortoise hatchling care. A hot spot or basking spot should be provided on a thermostat of about 90 F degrees. A cooler end should also be provided for the tortoise to escape the full heat from of no less than 20 degrees. At night the hotter end of the table must be reduced and the temperature should be maintained at 68 F.
It is essential that your tortoise has a UV light. 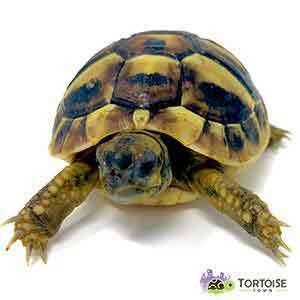 Without UVB light your tortoise cannot metabolise calcium, which can lead to skeletal problems. We do not advise a combined lamp for hatchlings. This is because you do not have control over the temperature of a combined self-ballasted lamp, because it cannot be used with a thermostat. Please ensure that your Tortoise is fed the most natural of foods. A weed and plant diet is essential. Under no circumstances should you feed meat to your Hermann’s tortoise or any fruit or vegetables. Food supplements are essential. After the first year of the tortoise’s life, twice a week of a light calcium dusting is sufficient. Lettuce has its place as a hydration tool but contains virtually no fiber or nutritional value either. Do not feed any plants that have had pesticides or fertilisers used on them. Hermann’s tortoise are some of the nicest and smallest pet tortoises for sale. Hermanns tortoises are known for being outgoing, far from shy, friendly and active. They are probably the most popular small tortoise for sale that we offer, along with the russian tortoise for sale. Being members of the “Testudo” or “mediterranean” tortoise family, they are grouped with other popular tortoises for sale, like the russian tortoise, greek tortoise, egyptians and a few others. There are 2 major subspecies one being the Eastern Hermann’s tortoise (Testudo hermanni) and the other being the smaller, slightly more colorful Western Hermann’s tortoise for sale (Testudo hermanni hermanni). We have some beautiful captive bred hatchling hermanns tortoise for sale, well started 6 month old baby hermann’s tortoise for sale, as well as yearling Eastern Hermann’s tortoises for sale. Turtles for sale or tortoises for sale? Tortoise Town is proud to offer a variety of captive bred box turtles for sale, turtles for sale, tortoise hatchlings for sale, including sulcata tortoise for sale, baby sulcata tortoise, russian tortoise for sale, burmese star tortoise, Sri Lankan Star Tortoise, indian star tortoise, box turtle for sale, we offer the ability to buy pet tortoise online and get it shipped overnight to your door. 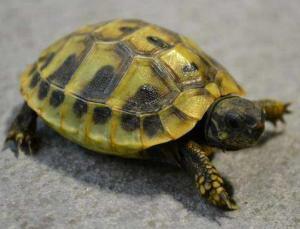 We have beautiful baby greek tortoises for sale as well as golden greek tortoise hatchling. Researching proper leopard tortoise care is pivotal to raising a healthy leopard tortoise baby and adult. As a captive bred tortoise breeder and tortoise farm, we have the highest quality baby star tortoise, leopard tortoise on sale, burmese star tortoise for sale, box turtle for sale, baby sulcata tortoise for sale, african spurred tortoise, african spurr thighed tortoise, spur thighed tortoise for sale, russian tortoise for sale, greek tortoise, we also offer baby hermann’s tortoise to buy online. If you’re looking to buy a very colorful baby tortoise, than considering checking out our gorgeous baby red foot tortoises for sale, and baby yellow foot tortoise hatchlings. Some 0f the most important things to do before you buy a leopard tortoise online is to find the right baby tortoise for sale and the tortoise breeder before you choose your new tortoise. When considering a baby tortoise for sale or baby tortoises for sale online, consider buying from a real tortoise breeder that provides lifetime customer support, free of charge. Leopard tortoises (tradtional common Leopard Tortoise) Pardalis Pardalis also known as the Giant South African Leopard Tortoise for sale. We offer Leopard Tortoise hatchlings for sale, baby tortoise for sale, well started leopard tortoise for sale as well as adult leopard tortoises from time to time when available.